ST. CLEMENT’S ISLAND, Md. (CNS) — On their four-month ocean voyage from England to the new Maryland colony nearly 400 years ago, the approximately 150 men and women on board boats named the Ark and the Dove endured stormy seas and the risk of being ambushed by pirates. And when their ships sailed through the Potomac River and made landfall March 25, 1634, on an island they named after St. Clement, the patron saint of mariners, they came ashore offering prayers of thanksgiving as Jesuit Father Andrew White celebrated the first Mass in the English-speaking colonies. 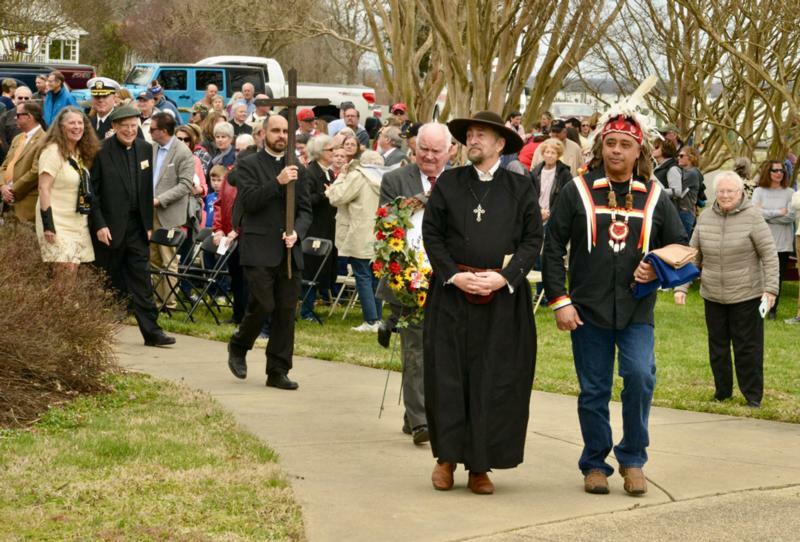 That heritage was celebrated in a special way this March 25 on the annual Maryland Day, as a treasured artifact of early U.S. Catholic history — a 17th-century iron cross believed to have been hammered together by a blacksmith on board either the Ark or the Dove — returned to St. Clement’s Island in Southern Maryland. “I did stumble across it. … That’s how it got reclaimed,” he said. After landing at St. Clement’s Island, the colonists — who included Catholics and other Christians — established their settlement at nearby St. Mary’s City, which became Maryland’s first capital. A reconstructed Brick Chapel at Historic St. Mary’s City based on a 1667 building stands today as a monument to Maryland’s pioneering role in safeguarding religious liberty, which would later be enshrined as the first freedom in the U.S. Constitution’s Bill of Rights. The cross also has been part of a modern historic event, when it was displayed on the ambo that Pope Francis preached from in 2015 outside the Basilica of the National Shrine of the Immaculate Conception in Washington, when the pontiff presided at the first sainthood ceremony ever held in the United States — the canonization Mass for St. Junipero Serra, the famous 18th-century Spanish Franciscan who established missions along California’s coast. Erosion has caused the island to diminish to 40 acres, about one-10th of its size when the English colonists landed there. Now visitors can take water taxis to visit St. Clement’s Island State Park.